I am a person who is always looking for ways on how to save and how to give. 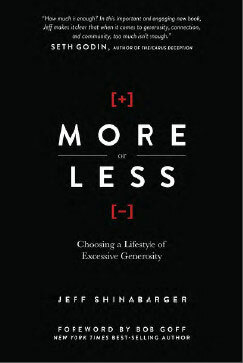 But when I found the book More or Less by Jeff Shinabarger, I realized that those are just excuses—deep inside I want more—I want to acquire by spending less. It’s called cheating. I’m just circling. More or Less points me to the right direction—the road to having enough. Just when I thought how difficult it is, Jeff Shinabarger showed the realization of endless possibilities through the experiments and challenges that he and all the people who have voluntarily made a commitment. Although the experience is overwhelming, still I manage to choose two important lessons which are closed to my heart. 1. Acknowledging oneself as good enough. The author emphasize personal adequacy. Things cannot fill the void of having the feeling of not being good enough. Always wanting to be the best yet felt short or inadequate; when in fact we are wealth of wonders. We have gifts, talents we can share to the rest of the world. If you want to make a change, look inside you. 2. The Act of giving starts with realization. Once I realized that I don’t need things to define or validate myself, a giving heart starts to grow. I look around of how much I have; I see things I have been holding on. The more I cling to them, the more I delay meeting the need of others. Their time is up in my possession. They should belong to someone else. More or Less shows that it is possible with the help of people who have fought the battle through their experiments, like a scientist, through perseverance and determination, eventually, discovered a new form—a new perspective—becoming the person wanting to give more, resisting to waste less, and persisting to see one’s self as enough. It is not an easy road to travel but the effort of Jeff Shinabarger has shown the path where to start. I am part of the solution. I can have a meaningful life of service for others while nurturing my soul, increasing one’s value not with material possession but through contribution. Take a look at some of the inspiring words from the book, from the lives of generous individuals. By design, we must fully live the life that only we can live. Every person that lives less than his or her potential is limiting all human potential because that person is not offering the world the fullness of his or her true self. Helping others through voluntary suffering is a short-term experience that forces us to engage a long-term problem. Presence is a physical expression of love in the midst of a culture that never stops—it is to stop and be with someone that matters. We can’t do everything; we need to understand our own limitations and pursue our true purpose. Choosing solitude is a choice to feed your soul, mind, and emotions as much as literal food and water are necessary for your physical health. We all find ourselves wanting more when we do not have a confirmation of our calling. We mask the unrest in our souls by wearing clothes and accessories that make us feel good. Deep inside, however, we still long to understand our purpose and passion in life. In every circle in which we gain access, may we invite another person along with us. Much word can be said about the book but mine will always be an understatement. Watch the videos in More or Less Book and have a glimpse of the stories of people who see beyond their own needs. Did you read the book? Is your closet too sick, upset that it cannot take more stuff? Doing the former can help you solve the latter, deliberately. It may be daunting at first yet the results are rewarding for everybody. Have you planned any experiment yet? We can all use ideas—great or little ones. They are all good enough to make a difference.